In an updated study, Reuters news agency has identified 3,810 neighborhoods where recently recorded child lead poisoning rates are at least double those found in Flint, Michigan during the height of that city’s water crisis in 2014 and 2015. 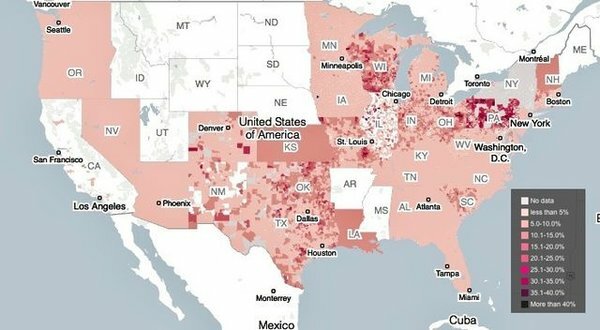 In some 1,300 of these “hotspot” communities, the percentage of children six and under with elevated lead levels was at least four times the percentage in Flint during the peak of the crisis. In pockets of Baltimore, Cleveland and Philadelphia, where lead poisoning has spanned generations, Reuters reported that the rate of elevated tests over the last decade was 50 percent or higher. An interactive map released with the study shows one census tract in Buffalo, New York—a former steel and auto center that, like Flint, has suffered decades of deindustrialization—where 68 percent of the children had high levels of lead.